This easy Kahlua Brownies recipe uses just a few simple ingredients and take no time at all to make – and you can also make these brownies in a Thermomix! Now if you are wanting a brownie recipe you can enjoy with the kids, you should stop scrolling now and instead check out these Double Chocolate Chip Brownies instead! 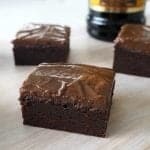 This easy Kahlua Brownies recipe is certainly one for the grown ups only, thanks to a good hit of Kahlua in both the brownies and icing. This recipe is based on my go to chocolate brownie recipe which I’ve experimented with over the years. Yes, you can use a Thermomix to make this recipe, however it’s also incredibly easy to make them conventionally too. These Kahlua Brownies are rich, soft and very chocolatey (that’s totally a word right?!) so you only need one (ok, maybe two) to satisfy any chocolate cravings. They make a great dessert or treat at your next party, or you could just make a batch to hide in the pantry to enjoy once the kids are in bed – there is no judgement here!! I’ve included both cooking methods below, and if you try this recipe, I’d love to hear how it goes! These easy Kahlua Brownies are the perfect treat for the grown ups - Thermomix instructions also included. Preheat your oven to 160 degrees and line a 20cm square baking tin with baking paper. Place the butter, caster sugar and cocoa into a large saucepan and cook (stirring regularly) over a low heat for 5 minutes or until butter has melted and ingredients have combined. Remove the saucepan from the heat and add the vanilla extract, eggs, plain flour and Kahlua and whisk to combine. Pour the mixture into the prepared tin and bake for 35 minutes. Allow the brownies to cool completely in the tin before making the Chocolate Kahlua Icing. Place all of the icing ingredients into a small bowl and mix together until combined. Use a spatula or a butter knife to smear the icing over the top of the completely cooled brownies. Give the icing 20 minutes to set and then cut into pieces and enjoy. You can also enjoy these brownies without the icing. These brownies will keep in an airtight container for up to three days. If your icing is too stiff and not coming together, add an extra teaspoon of boiling water. This Thermomix Kahlua Brownie Recipe makes a great dessert or sweet treat for the grown ups. It's simple to make and can be made using a Thermomix too. Preheat your oven to 160 degrees and line a 20 x 20cm square tin with baking paper. Place the butter(cubed), caster sugar and cocoa into your Thermomix bowl and cook for 3 minutes, 65 degrees speed 1. If the butter hasn’t quite melted, cook for a further 1 minute, 65 degrees, speed 1. Add the vanilla extract, eggs, plain flour and Kahlua and mix for 10 seconds on speed 4 to combine. Scrape down the sides and mix for a further 10 seconds on speed 4. Pour the mixture into your prepared tin and bake for 30 – 35 minutes. To make the Kahlua Icing, combine all of the icing ingredients into a small bowl and whisk until smooth and combined. If your mixture is too hard (you want to to be spreadable) add an extra teaspoon of boiling water. It's important to let these brownies cool in the tin before topping with icing, otherwise it will melt and slide off the top of your brownies. You can also enjoy these brownies without icing if your prefer. You can find more yummy recipes in our ebooks and print books – view the collection here.